The practice of leg-balancing is an integral part of the yoga discipline. Everything that requires you to be on your two feet without the aid of a supporting structure either to sit or lean on is essentially an act of leg-balancing. When you walk, you are negotiating a solo leg-balance within a highly compressed time-frame since there is a split-second when you have to hold one leg in mid-air within your gait. Where yoga tests you is in drawing out the length of time that you hold a leg-balance on just one leg. The inclusion of a leg-balancing routine has significant positive ramifications from a safety as well as performance perspective. I will explore both these angles and look at how yoga can assist in these two areas and offer a complete solution for strength and flexibility training. Of course this is just a very broad outline and many other muscles that power the hips from the group of core muscles, adductor and lateral rotator also play a role. The principal objectives in yoga when working through these leg-balancing postures is to try and build strength and flexibility in these muscle groups as well as improve flexibility and range of motion in key joints, whilst restoring the connective tissues around these joints. The inclusion of Yin Yoga in a practitioner’s yoga routine can help address the latter. I’d like to start by sharing some statistics with you affecting two very different groups of people. In a survey conducted by Safe Kids Worldwide in 2012, canvassing the most common injuries affecting youths playing sports, ankle injuries rated as the highest at 15% followed by injuries to the head at 14% and the fingers at 12%. In a separate study conducted by the University of Wisconsin and reported in the Clinical Journal of Sport Medicine, it was found that college basketball athletes who had inferior balance as determined by a pre-season postural sway test were more likely to suffer ankle sprain injury during the season. The idea behind the survey was to see if measurement in a unilateral stance could help predict susceptibility to ankle injury thus reducing athlete’s exposure to such risks, missed days in season as well as health costs. On another alarming and related footnote, in a research conducted by the American Academy of Paediatrics last year, it was found that ACL tears amongst school – aged athletes had been rising at a rate of 2.3% annually over the last 20 years with risk peaking for females at 16 and males at 17. The Academy posited in its conclusion that “neuromuscular training” and “preventative training incorporating plyometric and strengthening exercise, combined with feedback on proper technique appeared to be most effective”. The increasing workload placed on youth athletes driven to succeed in sporting codes supported by million dollar endorsements and sponsorships coupled with their immature muscular – skeletal frames has created a perfect storm resulting in a rising trend of youth sports related injuries. As the commercialisation of sports is unlikely to diminish in the near future one would venture to suggest that a greater integration of strengthening techniques addressing risk areas be included in a young athlete’s training programme. Speaking of increasing workloads in the modern high school setting with regards to athletes, it is worth noting in a study presented by Loyola University Medical Centre in Chicago, that kids who train more hours than their biological age are 70% more likely to suffer over-use injuries, parents take note. The study focused on 8-18 year olds and of the 859 injuries suffered, 564 resulted from overuse activity. The study was a warning against the risks of sports specialisation at an early age and the higher risks of stress fractures to bodies not yet fully developed. Although my expectations are low that high school sporting codes will reduce workloads in the near future – often it takes a major paradigm shift in awareness to effect a change like that – I do think that parents and caretakers should take a more active interest in the rehabilitation routines of their kids if they do happen to be playing a) a competitive sport b) specialising in that sport c) training more than 10-12 hours a week and that includes training as well as actual game time minutes. Alternatively schools that have in-house trainers who work with their premier teams need to consider a broader approach in their programmes and integrate strategies for recovery during heavier training periods. In terms of sports that present the highest risk to ankle and knee injuries, basketball, soccer and football rank highly on the list. In New Zealand, you could probably add netball and rugby to that list also. Lets take a look at the other end of the population spectrum. Falls are one of the leading causes of fatal and non-fatal injuries for the senior population. Statistically, one in four Americans over the age of 65 falls each year. According to the US Centre for Disease Control and Prevention, every 11 seconds an older adult is treated in the emergency room for a fall and every 19 seconds, an older adult dies from a fall. On a personal note this subject is close to my heart. Sadly, both my maternal and paternal grandmothers suffered serious complications from falls which eventually resulted in their passing over time so this subject has a real personal significance for me from that perspective. What I observed was the loss of quality of life as a result of the falls. When a fall happens, the elderly are more likely to retreat and avoid certain activities thus resulting in a diminished enjoyment of social activities and contact with friends and family members. In my maternal grandmother’s case, her fall provoked a stroke which left her bed-ridden for a number of months prior to her passing. Thus in her case her fall left her in the worst possible scenario – not fatal yet traumatic enough that she no longer had quality of life. Although weakness in ankles and legs are not the only contributing reasons for age related falls ( other age-related maladies play a role such as dementia and hypotension causing dizziness to name a couple ), the gradual weakening of muscles and the onset of osteoporosis can definitely be slowed down with an a regular strengthening programme. Yoga especially is ideal for the senior population given its gentler pace. Safety and injury prevention aside, weaknesses in the ankles and legs can prevent an athlete from exploiting their full physical potential in the competitive arena. The expression “A chain is only a strong as its weakest link” is certainly true of how the athletic body as one kinetic chain relies on a series of joints and muscles to work synergistically to effect the transference of power. An athlete with powerful hips and muscular quadriceps will not be able to effectively exploit explosive power from these biomechanical capabilities if the ankles ( and knees ) are weak. Weak ankles prevent a runner from planting their foot properly when striding therefore affecting push-off so the majority of the power is lost in this kinetic chain. In addition leg-balancing training in yoga can help enhance that much vaunted asset and buzz-word in the athletic arena known as “proprioception” – the ability to sense the relative position of your limbs and body parts and the level of effort required in its movement. You can read about that here in my last article dealing with arm-balancing. As I mentioned in the opening paragraph, the holding of postures in yoga on one leg over a number of counted breaths tests a practitioner’s strength and mental fortitude. However where yoga parts ways with other strengthening techniques and methodologies is the addition of unique flexibility and strength requisites needed to execute a posture gracefully and with ease. Let’s take the leg-balancing postures from the Utthita Hasta Padangusthasana series, commonly known as Hand to Big Toe pose. In this pose the practitioner balances on one leg whilst holding on to the the big toe and goes into flexion thus drawing torso and leg towards each other. 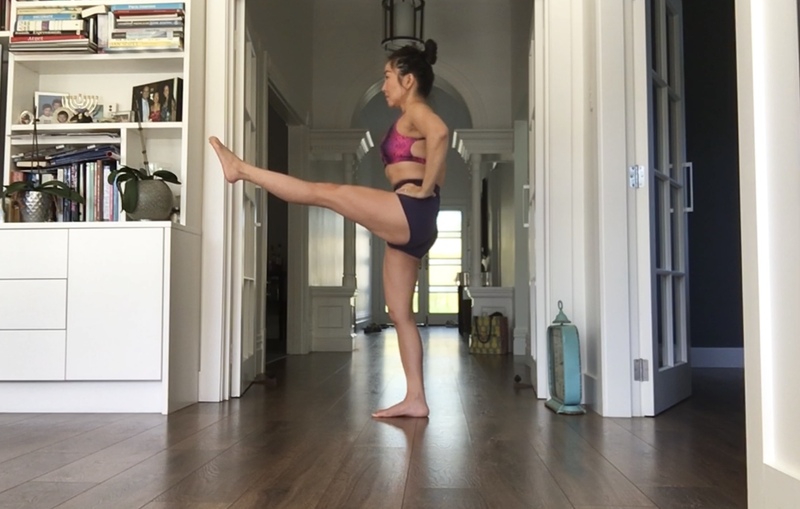 In addition to being able to balance on one leg, the practitioner must also have flexibility of the hamstrings as well as developed hip flexors, in particular the iliopsoas to be able to draw the leg and torso towards each other. Take another pose known as Vriksasana or Tree Pose, commonly taught in a Beginner’s Class. In this pose, the practitioner balances on one leg whilst bringing the other into external rotation before placing the foot of the externally rotated hip to rest against the inner thigh of the standing leg. So here, in addition to being able to balance on one leg, the practitioner will also need to have flexibility and range of motion through the hips to be able to execute this pose. The next step to this is being able to bind hand to foot in a standing pose such as Ardha Baddha Padmottanasana or the Half – Bound Lotus Standing Forward Bend. At this point in addition to hip flexibility the practitioner is also required to have flexibility in the knee joint in order to bring the leg into half lotus and then flexibility of the chest muscles, range of motion within the shoulder girdle and developed muscles between the shoulder blades in order to accomodate the binding of the hand and foot in lotus. As you can see, the variations are endless in terms of how yoga postures demand strength and flexibility in every corner of the human body within the spectrum of classical leg-balancing postures. Thus in addition to addressing the particular weaknesses of the legs, yoga asanas also demand upper body stability, muscular flexibility and range of motion from hip and shoulder joints. I may be mistaken but there are very few fitness programmes in the modern gymnasium setting that can effect so much influence on a practitioner’s body whilst helping improve mental wellbeing.